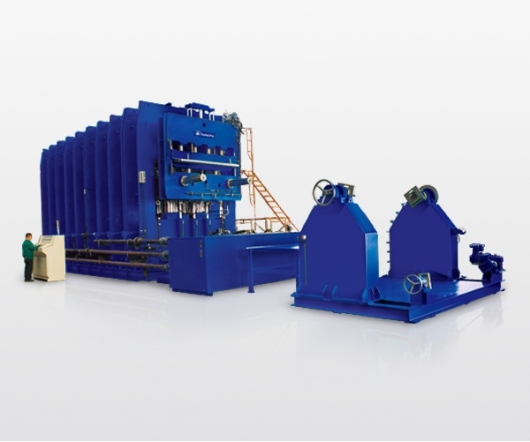 ●Custom design heavy duty (large tonnage) vulcanization equipment available, production capacity up to 13000 tons. ●Central control / system by PLC and touch screen controller. ●Equipped with cooling system on the bottom of cylinders to prevent oil temperature increase and maintain better endurance operation. ●The bottom of cylinders is contacted to platen with full pressing area to have even pressure and better product quality. ●The seal of cylinders is located far from platen to have longer life cycle. ●Top cap of cylinders is designed with oil return hole to prevent product polluted from leaking. ●Customized heating platen size design available.